Epoxy floor coating is the durable flooring solution you’ve been looking for! This stain-resistant, heavy-duty flooring is designed to withstand the day to day abuse your employees and equipment will naturally put it through. 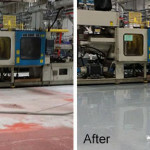 Trust in North American Coating Solutions to transform your industrial flooring for the better. Call us today at (586) 226-9416 for a free quote on your epoxy floor coating. Epoxy floor coating is much more affordable to install than completely new flooring, and its outstanding durability will save you money in replacement floors. 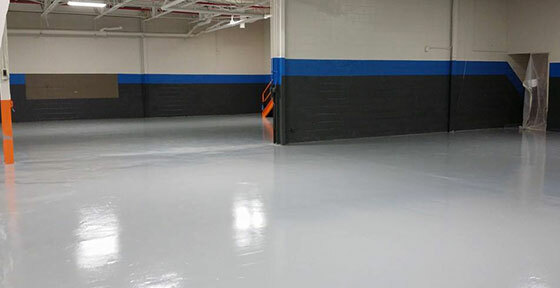 Contact North American Coating Solutions to find out if epoxy floor coating is right for your business. Epoxy floor coating can be customized to meet the needs of your business. The epoxy is available in a medium-duty and heavy-duty format, and both options will last for years without any cracking or major damage. You can select from a variety of amazing colors and patterns when you pick out your epoxy flooring, so you can turn your work space into a showroom. Choose a color that fits your design aesthetic, and consider adding flakes and other textures to it. This will give the epoxy floors more dimension, which will improve their appearance as a whole. Call now to learn about our exciting selection of epoxy floor coating and polished concrete services. One of our knowledgeable staff members will go over your flooring choices with you over the phone, and then you can select the best floor coating to add to your business. Contact North American Coating Solutions at (586) 226-9416 to learn about our tested and proven epoxy floors. We provide a five year workmanship guarantee on all of the floors we install, so call now for a free, no-obligation quote on epoxy floor coating.